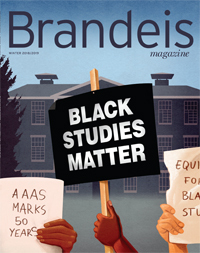 When we relaunched Brandeis Magazine two years ago, we decided to devote the annual summer issue to a theme, preferably a fun one. Last year’s debut theme — food — turned out to be the editorial equivalent of a 10-course meal. We discovered Brandeisians engaged in virtually every aspect of the food world with unalloyed gusto and creativity. This summer’s theme — the entertainers — places on center stage a cast of alumni who are also obsessed with their craft, whether it’s acting, writing, producing, directing or designing. Of course, the pool of talent is much deeper and larger than we’re able to capture in these pages. What’s more, we opted to devote a sizable section of the magazine’s real estate to rising stars — not just actors, but a constellation of alums on the upward arc of their career as producers, filmmakers and writers. As we reported these stories, subjects often mentioned — mostly unprompted — Brandeis’ influence on their professional growth, and a common refrain began to emerge. Technical training was substantive at Brandeis, they said — from voice, to production design, to fight choreography. But the university’s true impact can’t be entirely captured, they noted, by the ability to belt out a song, adopt a convincing accent or even produce a successful play or film. Luckily for us, the audience, while self-awareness may be the starting point for many of the artists and entertainers in this issue, it is hardly the endpoint. So get your popcorn, sit back, relax and enjoy the artistry, showmanship and glam — on-screen, onstage and behind the scenes — that these alumni bring to showbiz.